Did you ever get complaints about slow logon times for users running on a Terminal Server? Probably the answer is yes, but what is slow? And can I measure this with hard numbers? 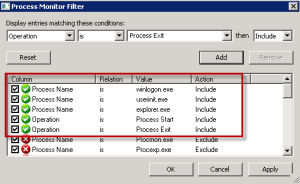 Yes you can do this… By using Process Monitor! And I will show you how. 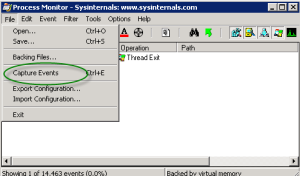 Logon to the server with the local Administrator account and start Process Monitor. Stop the capture and clear everything, this prevents the ProcMon from using unnecessary resources for now. Also filter to only show process Start and Exit. – Winlogon.exe: You can see the first process to kick of is the Winlogon.exe. It is starting on logon and ends when a user clicks the start => logof button. This entry was posted in Computers, Guides. Bookmark the permalink.